Foldeasy Toilet Safety Frame Travel Bag is a carrying bag specifically designed to protect your Foldeasy toilet aid frame. 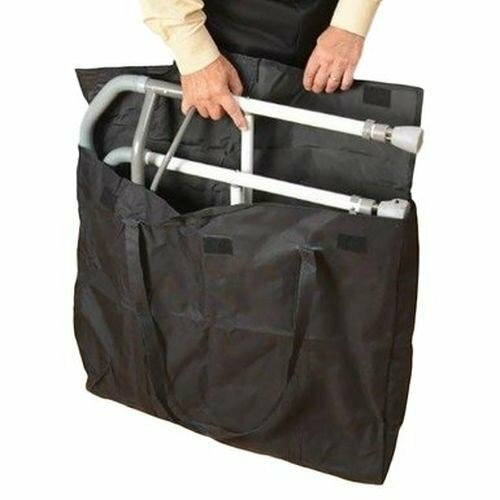 While other mobility equipment cases are bulky and difficult to use, this carrying bag makes it easy to safely and discreetly transport your Foldeasy toilet aid. Constructed from a durable canvas type material and equipped with VELCRO brand fasteners and shoulder straps, this carrying bag has everything you need. Foldeasy Toilet Safety Frame Travel Bag is a discreet and casual black color and has a closure flap and ample shoulder straps for easy, hands-free carrying. Simply fold your Foldeasy Toilet Safety Frame in half, turn on its side and slide into the bag - it's that simple! You might also be interested in similar mobility equipment to the Foldeasy Toilet Safety Frame Travel Bag, such as Toilet Safety Frame by Carex. VELCRO brand fasteners with room shoulder straps for comfortable support while carrying your Foldeasy. Constructed from a comfortable and durable canvas material. Sleek and casual black color is discreet and low-key. Thirty-day return policy for other than defects, if returned in new condition in original packaging. Under these conditions, a 30% restocking charge will apply.